So the next stage, if this project is going to work, is for everyone to grab a camera and share their thoughts on what we feel the opening motions of Saifa represent! 1 – Absolutely ALL contributions are valued. 2 – It does not matter if you know or practise the kata; we still want your contribution. A fresh pair of eyes can sometimes give the best insights. 3 – Because we are all looking at the same sequence, there is sure to be some repetition in what we present. No matter how similar some of the ideas maybe, every presentation will add something and may resonate with viewers in a way that other may not. So as many videos as possible please! 4 – We are not looking for a single “right” answer. We are looking to provide a resource for people to look at and draw ideas from. 5 – We will be employing a “contribute to critique” policy. If you don’t like what someone has shown, then you need to get out of your chair and put your own ideas up for critique too. 6 – Style variations are, of course, encouraged and should also be explored. I’m sure not all those involved will perform the kata exactly as shown below. If you do it differently, then show the bunkai for your variation. This all helps add to the knowledge pool. 1 – Film your bunkai for this sequence. Editing, captions and all that fancy stuff are an irrelevance. 2 – Upload it to YouTube. This is very easy to do and opening an account is also straight forward. In the settings you can decide if you want the video to be searchable or not, and if you wish to permit comments on YouTube. Make sure you enable embedding! 3 – Post the link in the comments to this post, along with any explanatory text you wish to add. 4 – I’ll then come along and embed the video so it is directly watchable on this page (only those with Admin privileges can embed videos). 5 – I will also share each new video via facebook, twitter, etc (unless asked not to). If this provides the kind of response I hope it will, then we will do it all again in a 6 to 8 weeks. Obviously, for that one this sequence is banned (because we will have already done it). I know there are loads of you out there with great ideas so please get your thinking caps on and your cameras out! Not mine, but here's some pretty interesting Saifa bunkai performed by Giles Hopkins, a Rokudan in Goju. I like his take on the opening moves; and that last move is... well... have a look. In any case these are our intial thoughts, for what they are worth. Hope you find them of some use. Excellent variation! Style isn't relative to application. You obviously understand bunkai-application extremely well. You should add more commentary. You have an excellent mind; well-disciplined for martial arts. here are some aikido versions of the opening movement in Saifa: i.e. sankyo, etc. Because the initial movement is a clasped hand the potential for different wrist locks and throws is enormous. The clasping hands, as well as its circular rotation are the primary clues as to how you'll lock up, takedown, or throw your opponent: i.e. depending on which arm/hand they are attacking with. Also, footwork should not be ridgid: anchored to the floor. You can easily execute a 180 degree foot pivot to add to the grappling application's efficiency. If your hand technique goes left, then pivot on the right foot to amplify. The same if your hands move right, pivot with the left foot. If you're executing the 2nd technique in Saifa kata, this is a possible application. One hand rises, the other falls while you kick. Here, the possible application is that the kick implies a possible step-turn moving in the direction of the downward arm/hand. The rising hand strikes or grabs the opponent's head/neck. Add a circular step and turn and you have excellent head throw. Wow! Some of you have been very quick off the mark! Really like those Garth. “Dash3’s” demonstrators also brought a smile to me face. Very cool! I hope to get mine filmed later this week. We have taken the opening sequence of Saifa and put it in to a vertical grappling range. The defender is losing out in the grapple so grabs attackers groin to cause pain. The attacker grabs the hand to stop the grab (we have found that when the groin is grabbed the cross hand is used most often used to stop the grab, when the eye is gouged the same side hand is most often used). When the attacker grabs the groin this leaves him open on that side to an elbow to the head as the defender steps forward as in the opening move. Once the defender has done this he steps back and drops weight in sumo stance and locks attackers elbow. We have also found that during a struggle the lock that is optimally applied with the ottoshi empi (dropping elbow) was often reduced to being secured with the armpit as a fail safe! Then the backlist is delivered to the head. The attacker then steps up and rotates the attackers head and body around to the other side as in the repeat of the opening sequence and pulls him down onto their sumo stance raking eyes with the hikitai hand and elbowing face/solar plexus. Thanks to all the Shogun Karate team for their contribution. Here's 3 different ideas for the opening of Saifa performed by Sensei Alan Wood and Anthony Watson at Itansha Karate, Greenacres Dojo, Oldham, Lancs. UK. Even from the Kyokusen arm action at the start of the kata including the two hand together position [Meotote / married hands] the Ohyo is in your mind and is indeed part of the action they are not salutation, they are Hyomengi. This is something that when studied much deeper reveals a miriad of options. The diagonal stepping creates an imbalance [kuzushi] the step back through the opponent with Shiko Dachi creates chikan [displacement]. The koshi gamae can be interpreted as many things from a Kumikata [gripping method] arm bar to ko empi uchi [rear elbow strike]. 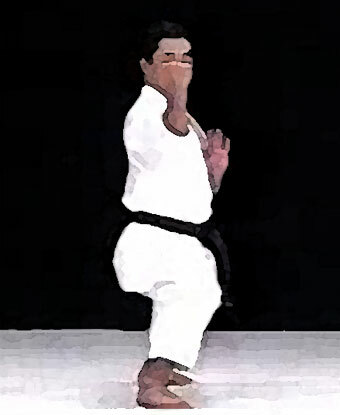 The Tate Shuto Uchi standing knifehand posture can be anything from a Shime Te [constriction technique to a grab] the leading hand is an optimum posture which can be Uraken Shomen Uchi [ front inverted fist strike to Empi Otoshi Uchi [descending elbow strike]. They all depend on the task you choose and in the order you choose it, whether Omote or Ura, the optimum position is the base technique, the variants [hente] are your choice [they are not set in stone] . This was a quick video I did while at work on my phone. The Video didn't quite turn out as planned but, I hope the point gets accross. This is the first time I have seen this form and the application im using is from Baijiquan. A couple of options for the opening of the Saifa ~(Sai - to smash, Fa - to tear), the principle is to escape from a grab and strike(smash). There is a lot of good information in Gavin Mullholland's book "FOUR SHADES OF BLACK" but not wanting to copy exactly Gavin's interpretations here (which I think are excellent) I have varied my bunkai based on the same principle. Though this is not a kata we practice in our system, I thought I'd give it a shot. Hopefully it's close enough to the correct performance to work. I looked at a couple variations before deciding on this one. Starting with a wrist grab escape which was workable but, didn't fit the sequence closely enough for my liking. The sequence shown matches the movements of the kata and seems to be fairly practical. It answers the question of why you have an open palm instead of a closed fist (which drove me crazy at first). It addresses the footwork and angles in the form. And it takes you to and keeps you in a dominant position throughout. The sequence in the video is the answer that "checked the most boxes" for me in my brief look at this kata. I will say that there is a small concern with the sharp pull of Uke's arm in the first step. Be sure not to bang heads if you try this. We didn't but the possibility it certainly there. Also, sorry for the bad audio. We were sharing the space with the fencing club, which you can clearly hear in the background. Here is my take on the opening moves of Saifa. I'm afraid it's not terribly flashy and we only very quickly put it together but it shows what I think are the important principles. My take on it is that it is extremely simple; we take an instinctive reaction to being grabbed and improve on it. The 1st 3 moves of saifa to me are simply the tearing motion, moving with the force in order to accentuate the tearing motion to free your self. The strike is not a finishing strike - it's just to regain intiative. The next part of the kata show possible follow on techniques - and there is a lot of smash there. Incidentally - I think Saifa is Sai = tear (as in tear free not tear something) and fa = smash. As in Kururunfa which means "to hold something for a while and then smash". I think someone might have written around the wrong way earlier on. The point of it is that this ought to be applicable regardless of where you are grabbed (within reason). These are utterly brilliant! Thanks so much for all the contributions so far! I think I may share the videos one a day via facebook etc so loads of people get to see all this good work. Thoughts? I have no objection to my video being shared on facebook. Hopefully that would encourage more submissions. My sons really enjoyed helping me make the video and have enjoyed watching the view count go up since it was posted. Despite its simplicity, I see Saifa as a mine of close quarter, effective bunkai. Here is the submission from Sensei James Davey and I, which we did last week. Saifa is not a kata my group practises, but today (22nd of November 2014) I took the sequence to the dojo and we spent 10 minutes at the end of the class collectively exploring the possible uses for the motion. These were our favourite three. We feel these fit the kata well and leave no part of the motion unexplained. Thanks Tim, Fred, Darren, Callum, Joe, Charles, Richard, and Andrew for their thoughts. Hopefully it adds something to what is turning out to be a fantastic resource! Awesome contributions everyone! Three more from the class, similar principles but unique to the student. Some great stuff on here so far. I think there is something to be learned by looking at all the different interpretations. They all have a number of similarities and a few subtle differences. For anyone who wants to understand how differing styles developed, yet share similar katas, this thread is a living example. I think I've been inspired to make some refinements to my application and re-film now that I have been exposed to what everyone else is finding. It gets the wheels turning. Also. Neil, I really like the application you showed. It seems like it would be equally useful for a double or single-handed shirt grab. Hi all, Some really good stuff on here :-). Here's one of the applications I went through during one of my classes, any comments and suggestions welcome. Awesome! This is utterly brilliant folks! I think I’ll give it another week or so and then share all the videos via facebook, twitter and the newsletters. This is even better than I hoped! So much brilliant material! I am blown away by all of these thoughtful contributions. This has become one of the greatest threads of all time. A big thank you to Iain and all contributors! Couldn't resist having a go! By sheer coincidence I think it fits the 'tear and smash' name quite well!